A native to San Diego he was born and raised in east county and went to San Diego State to get his bachelors in psychology specifically in behavioral health. Through high school and college Sean always had an interest in physical movement specifically powerlifting and bodybuilding that changed with a severe car accident that limited his ability to perform the activities that he loved and as a result he began practicing yoga. Through yoga and mobility exercises he was able to regain his strength and range of motion from his previous injuries and shortly thereafter got his certification as a yoga instructor. at the same time Sean became a yoga instructor he also found CrossFit and was immediately hooked. 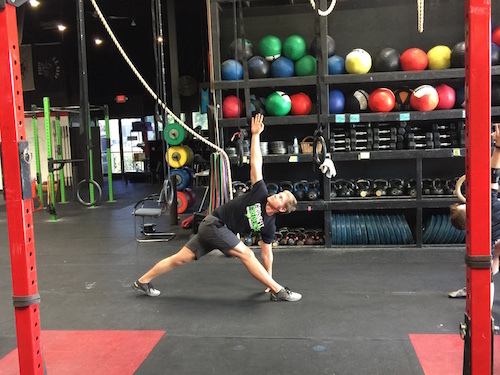 After two years of being a student of CrossFit Sean began crossing over his yoga and mobility techniques on to his CrossFit students using techniques he had learned through yoga teacher training and mobility exercises to improve their range of motion and posture to make them better and safer CrossFit athletes. From the beginning student who has never even performed an air squat to an advanced athlete, becoming more flexible, mobile, and stable and in better alignment will improve any athletes’ performance and dramatically reduce the chances of having an injury because of improper positioning in a lift or movement. This is Sean’s main concern and also his passion when working with athletes.